MUSE are Matt Bellamy, Dominic Howard and Chris Wolstenholme. Their last album, Drones, which was released in June 2015, was no .1 in the charts in 21 countries, including in the United States for the first time. With this album, they won a Grammy Award (their second) for best Rock album. Since their formation in 1994, Muse have released seven albums and sold more than 20 million albums around the world. Internationally recognised as one of the best concert groups, Muse have won many awards: two Grammy Awards, one American Music Award, five MTV Europe Music Awards, two Brit Awards, ten NME Awards and Seven Q Awards, amongst others. Muse au Stade de France le 6 juillet 2019 from Stade de France - StadeFrance on Vimeo. 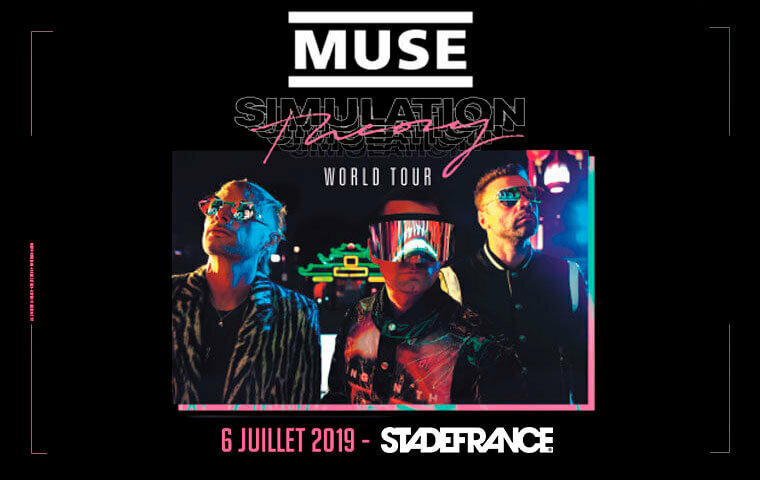 To book tickets for the MUSE concert on Saturday, July 6th 2019 at Stade de France, click on the "Book my seat" button to select the price category of your choice, add a parking space to your cart if necessary and proceed with the payment. Not receiving the tickets or receiving tickets for different seat categories than those ordered. As these sites have no certain and official source of ticket supply, they are not able to guarantee them to you. You have no recourse. In case of difficulty, you will not necessarily be able to call on a professional ready to meet their commitments and to compensate you if applicable, even though you have already paid or incurred transport or accommodation costs. Ticketing distribution sites appearing at the top of the results on search engines when you are looking for a ticket are not necessarily sites authorised by the producer of the show. Receiving an email confirmation is not a guarantee of the validity of the purchased ticket. Buy your tickets without additional costs and print them directly at home. Stade de France box office provides official and guaranteed ticketing services. The tickets prices and seating map that we offer have the prior approval of every event organiser. No need to chase up repayments any more! Buy in a group and share the payment of your purchase directly from the payment page. The Customer Service of Stade de France will be pleased to assist you with any requiry ! View from my seat ?